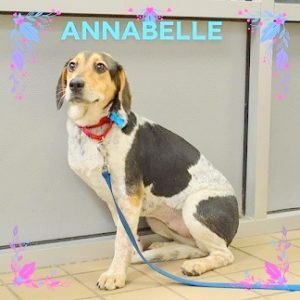 ANNABELLE is a sweet 7 month old Hound/Beagle puppy who arrived at Last Hope on a rescue transport with her brother BO. ANNABELLE is a bit more timid than her brother & could benefit from our reassurance. Please let her know Last Hope is a good place to be & our kind volunteers will give her tons of Love & TLC. Seems likely ANNABELLE will find this out for herself as she settles in.